This archive holds all posts form April 20, 2008. STEPHANOPOULOS: Senator Obama says he was eight years old when that was happening. MCCAIN: But he became friends with him and spent time with him while the guy was unrepentant over his activities as a member of a terrorist organization, the Weathermen. I don’t — and then to compare him with Dr. Tom Coburn, who spends so much of his life bringing babies into this world — that, in my view is really — borders out outrage. STEPHANOPOULOS: He also pointed out that he and Mr. Ayers have a very loose relationship. They live in the same neighborhood. There was an organizing meeting many, many years ago, in his house. And he says, frankly, I don’t agree with these comments that Mr. Ayers made. 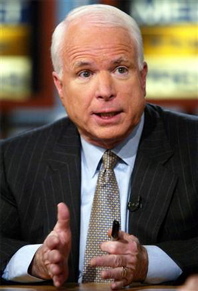 MCCAIN: Doesn’t agree with them? Does he condemn them? Would he condemn someone who says that they’re unrepentant and wished that they had bombed more — and compare him to a doctor, one of the great humanitarian — in my view, one of the greatest spokespersons for the rights of the unborn in America? Actually Senator Obama has condemned Ayers’ views and actions, which happened nearly 40 years ago when he was young, yet the white attack machine still is intent on fronting the white racial frame and thus, again and again, making Senator Obama the “dangerous black man.” This Ayers issue is old and irrelevant since (now respected education Professor) Ayers has not endorsed or worked for Obama as a presidential candidate, and is only a onetime acquaintance, and it has indeed been on white supremacist websites for a great many months. Fox News seems to have been the first to pick it up, then ABC News last Wednesday, and now the Republican candidate for president. So this is how much of the extreme framing of a Black candidate appears to work in this still-racist society: White Supremacist assertions => Fox News assertions => ABC News assertions => a Republican Senator running for president parrots the assertions without questioning. I wonder why there is no serious mainstream media questioning of the likely source of the original assertions or their political validity. Who were Alexander Lucius Twilight and Mary Jane Patterson? If you know, you are an excellent candidate for the “Jeopardy” category, “African-American firsts.” Knowing the topic of this edition of Diverse, you can probably guess the answer: “They were the first African-American male and female to be awarded bachelor’s degrees by a U.S. college or university.” Can you guess the years and colleges? For Twilight, it was in 1823, from Middlebury College. Patterson graduated in 1862 from Oberlin College. But despite the 39-year head start, males now represent a minority of bachelor’s degree recipients among African-Americans as well as within other racial/ethnic groups. SENATOR OBAMA: So I still believe in affirmative action as a means of overcoming both historic and potentially current discrimination, but I think that it can’t be a quota system and it can’t be something that is simply applied without looking at the whole person, whether that person is black or white or Hispanic, male or female. What we want to do is make sure that people who have been locked out of opportunity are going to be able to walk through those doors of opportunity in the future. SENATOR CLINTON: Well, here’s the way I’d prefer to think about it. I think we’ve got to have affirmative action generally to try to give more opportunities to young people from disadvantaged backgrounds — whoever they are. That’s why I’m a strong supporter of early childhood education and universal pre-kindergarten. . . . So that’s how I prefer to think about it. You know, let’s affirmatively invest in our young people and make it possible for them to have a good middle-class life in today’s much more competitive economy. Even as many African American students (and many other students of color) still face huge obstacles to getting a good education, including from direct racial discrimination and hostile racial climates in historically white colleges, as well as from the indirect effects of nearly four centuries of systemic racism (such as underfunded urban schools and community colleges), the two Democratic party candidates for president seem to be backing off on aggressive affirmative action directed especially at those who are major targets of racial discrimination, including African Americans. They seem to want to accent “class” over “race,” even though the data coming in on class-oriented approaches show they are not as effective as direct attempts to remedy the effects of racial discrimination. Is this yet one more signal of the white-washed character of this election as the candidates tiptoe around systemic racism issues (except for one very good speech by Senator Obama)?